Having waited almost two years for the return of 'Sherlock', we had the great pleasure of having two episodes within mere days of one another. Following 'The Empty Hearse' came 'The Sign Of Three', and a somewhat unexpected style and tone. The recap/review below is full of SPOILERS so tread lightly if you are yet to watch the episode. 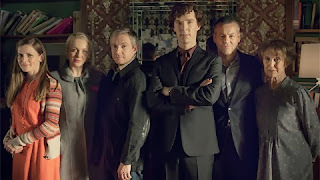 Rather unusually, 'The Sign Of Three' was credited to three writers - usual suspects/co-creators Steven Moffat and Mark Gatiss are joined by Stephen Thompson (who also wrote previous episodes 'The Blind Banker' and 'The Reichenbach Fall'). Perhaps the competing interests were responsible for the curious style of episode - moving away from the usual murder mystery structure, and more sitcom-based. Initially jarring, I enjoyed the episode much more second time around. Some of the main talking points follow. The opening scene of 'The Sign Of Three' effectively proved to be a setup for a gag about how tough it'd be for Sherlock (Benedict Cumberbatch) to deliver a best man's speech. But it also introduced two other elements - firstly, the return of Donovan (Vinette Robinson) who doesn't seem to have been reprimanded at all for her false accusations from the previous series, and secondly, the Waters Gang whose fate was far from resolved. I suspect they'll be back. It's rare to see actual human traits from Sherlock but his jealousy is obvious as Mary (Amanda Abbington) and John (Martin Freeman) mention the man (Alistair Petrie) who soon becomes a central component to the episode. If anything, perhaps Sherlock's jealousy is a little too obvious. Despite Sherlock's fastidious attempts to manufacture an excellent night out for John, an errant shot or two derails the evening rather rapidly. A situation which becomes even worse when they decide to entertain a client - Tessa, played by the typically wonderful Alice Lowe - their drunken behaviour proved delightful for some fans but for me, drunk Sherlock was something that I'd rather have not seen. Following a night in a prison cell, we eventually find ourselves at "the big day". A big day not just for Mary and John, but for Sherlock too, as he must finally negotiate the best man speech. Collecting the telegrams/messages from those who cannot attend, we again get a glimpse (albeit not actually on-screen) of the mysterious figure from the end of the previous episode - signing off a message as CAM. The message causes visible distress for Mary. CAM, aka Charles Augustus Magnussen, is set to be revealed in greater detail in 'His Last Vow'. Sherlock uses his best man's speech to recite the tale of The Bloody Guardsman, and reflect on John's skills - who manages to save the guardsman's life, although Sherlock fails to solve the case. Lucky for him though, everything comes together during this speech - Tessa's story had previously set up The Mayfly Man mystery, who Sherlock realises is targeting someone at this wedding. With an unusually grand amount of foreshadowing, the target was obviously Major Sholto. Not the type of lazy writing we have come to expect from 'Sherlock', although the method of murder was still fairly clever. One of the few highlights of the conflation of cases/plotlines during Sherlock's speech, this codeword returned after its appearance in the excellent Series Two episode 'A Scandal In Belgravia' (as seen above). Signifying the need for "battlestations", it sublimely upped the ante and drama as Sherlock continued his deductions. Just as we were getting used to Mary being an integral part of Team Sherlock, we get the revelation of her pregnancy. With two more series planned, it will be interesting to see how things develop between the three. Perhaps CAM will have a say well before then. At the very least, he better turn up in the forthcoming series finale, airing on Sunday 12th Jan.
Watch 'The Sign Of Three' on BBC iPlayer for a limited time.